Trafford School Sports Partnership - School of the Year! Kings Road Primary School has been named as the School of the Year at the Trafford Sports Awards 2016! The award was presented by GB Olympian - Craig Heap! We were very lucky to be invited to the Greater Manchester Games at the Etihad Stadium to present how the School Games Values have had an impact at Kings Road this year. Our SSOC representatives were nervous but received a round of applause at the end of their presentation. Click the link above to see our actual presentation! We had a very exciting visitor at Kings Road this week! Sue led an inspirational assembly, followed by some excellent teamwork workshops with our KS2 classes. 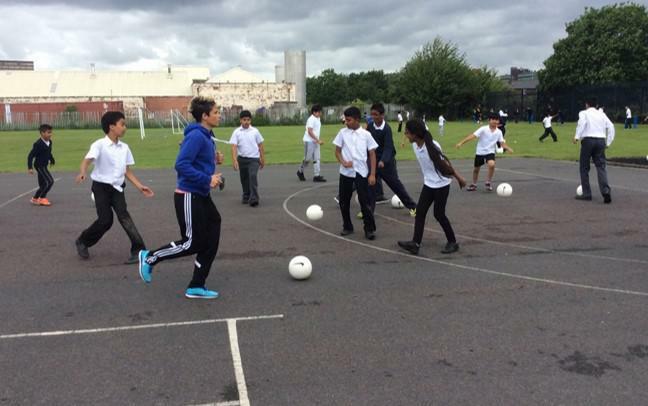 Not only that, but she led a crossbar challenge and a penalty shootout at break time! Thank you Sue! Have a look at this tweet by Heart Radio! Listen to the official report from Heart Radio which features Sue Smith and two representatives from our school! Recently, we had a special visitor to our school. Josh Bohannon who is an Academy player at Lancashire County Cricket Club, came to speak to our Year 5 and 6. He answered a Question and Answer session and the children got to meet Lanky the LCCC Mascot, along with seeing the T20 trophy. More photos to follow. Change 4 Life - Recently we have started an exciting new club where our children learn important skills such as teamwork, taking part, living an active lifestyle and changing our lives for the better. This week we learnt how to improve activities so they work out better for us. Here, we played some simple, fun games then changed the rules to see if we could make them even better! Wake Up Shake Up - Come join us at 8:40am every Tuesday-Friday for a Wake Up Shake Up where anyone can come along and have a great start to the morning!